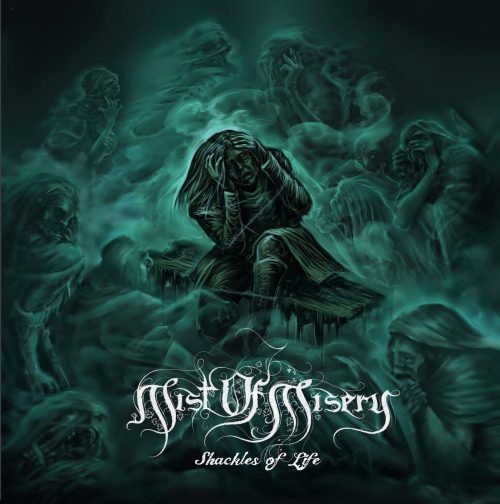 Black Lion Records released Absence, and on August 31st of this year Black Lion will release Mist of Misery’s follow-up recording, an EP named Shackles Of Life. This will be the first of two connected mini-albums, with a second one coming later under the title Fields of Isolation. Shackles of Life includes seven songs and features guest vocals by Paolo Bruno of Thy Light, as well as cover art by Russian artist Alex Tartsus. Today, we’re helping to premiere a stream of the album’s third track, “Broken Chains“. The song we bring you today comes in the form of a video, whose imagery provides a fitting complement to the music. The crumbling, abandoned interiors of the structures shown in the video match the desolation conveyed by the song’s heavy, doom-stricken riffs and the torment of the shrieked vocals. There is considerable beauty in the music as well — but it’s an intense, haunting form of glamor, as tortured as it is mystical. What begins as an atmosphere that’s almost angelic becomes frightening, with the rhythm transforming from a stately pace to blasting and the vocalist crying out in pain. And at the end, this expression of torment sweeps up the listener and transports them away in its mounting grandeur. Shackles of Life was mixed by Mortuz Denatuz and mastered by Ronnie Björnström of Defitory and EAP Mix Room (who has worked with such bands as Bodyfarm, Aeon, and Cut Up). As noted above, Black Lion will release the EP on CD and digital on August 31. Cover art, music and video visuals are all screaming DESPAIR. I loved the album, and I’m quite confident I’ll dig this EP as well.